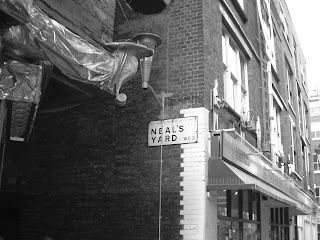 Neal's Yard Dairy 30 years old in 2010. 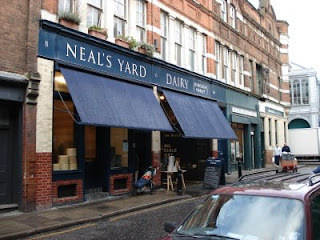 Ten years ago I stumbled across Neal's Yard Dairy more by mistake than interest. I've always liked cheese but never really had the passion for the producer or region like I did for wine, its appellations, and her personalities. This shop was my epiphany to great English cheese and cheese making. Stumbling around Covent Garden full of wine and beer in the twilight hours I noticed the strong scent of cheese and found in a slightly rundown courtyard this most amazing shop full from floorboards to rafters of strong maturing aromatic cheese from the far flung corners of the British Isles. A nibble here and a nibble there and I was on my way home on the tube with a selection of wonderful and stinky Stilton, Wensleydale, and Cheddar. Every trip to London since always involves a visit and taste at the original location or if it is market day at the Borough Market - the market shop. The two shops are still owned by managing director Randolph Hodgson, a Hong Kong raised Brit, with a Chinese bent for fanatically fresh food. 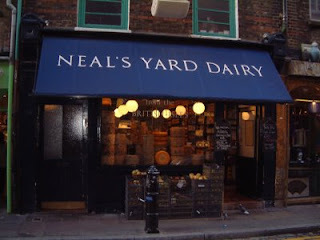 Neal's Yard Dairy represents about 200 British cheeses just shy of a quarter of the 900 cheese types made from over 7,000 farmhouse cheese producers throughout the United Kingdom. Personal favourites that I've tasted in the past year have included the Calston Bassett Stilton, Stinking Bishop, Hawkes Wensleydale, Isle of Mull Cheddar, and Wigmore soft sheep. In Vancouver you can find some NYD cheeses at Urban Fare http://www.urbanfare.com/, Meindharts http://www.feedyourcuriosity.com/code/navigate.php?Id=1, and Vancouver's best cheese shop Les Amis de Fromage http://www.buycheese.com/ I'm looking forward to some amazing tasting events in 2010 from NYD as well as some special farmhouse cheeses we have never seen or tasted before.